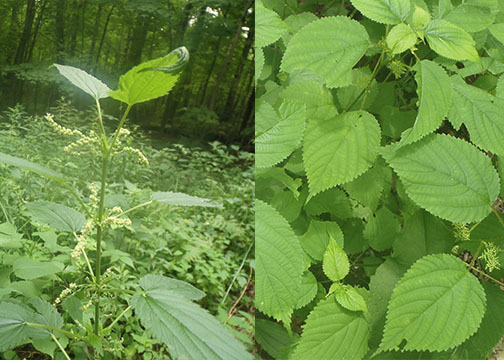 This is Wood Nettle that I, unfortunately, had a run-in with in Beartown State Forest, Lee. The plant brushed against my bare shins and I felt a painful tingling. Tiny hairs on the stems and leaves are what caused the sharp stinging pain. The fortunate thing is that the pain lasted only about 5 minutes and is certainly not as painful as a bee sting. Another member of the nettle family, Stinging Nettle, has similar properties. They grow in wet, woodland areas. Interestingly, the top leaves of nettle are good to eat. When steamed like spinach, the stinging hairs are deactivated. (Wear gloves to harvest!) They're full of vitamins and have many medicinal uses as well. Here's a link to more info and recipes. What an interesting article. Are you going to try any of the recipes?